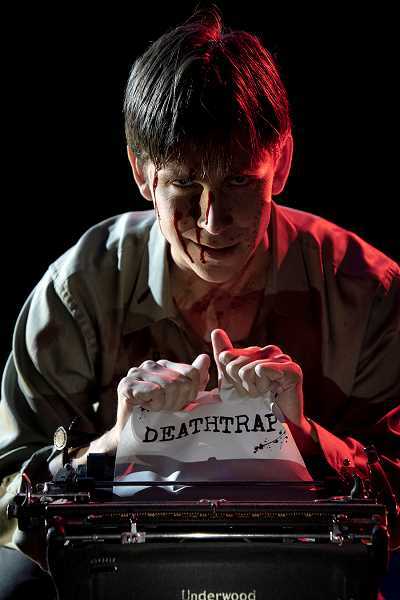 Bag&Baggage Productions present classic thriller, 'Deathtrap' by Ira Levin, this fall season. Two men scuffle across The Vault Theater in downtown Hillsboro, one with handcuffs wrapped around the other's neck. They fall to the floor, as one of them struggles under the other to catch his breath. With a sudden change of expression, laughing breaks out and the actors smile at each other, doing a complete reverse from when they were at each other's throats a few second earlier. Welcome to rehearsal at Bag&Baggage Theatre. A "fight call" is when two actors rehearse a scene with combat choreography, Bag&Baggage's founding Artistic Director Scott Palmer said. Four weeks in the making, and the actors alongside Palmer and Bag&Baggage's crew are prepping to bring to life their newest thriller, just in time for Halloween, the 1978 play "Deathtrap," written by author Ira Levin. Levin is known for his psychological tales "Rosemary's Baby" and "The Stepford Wives." 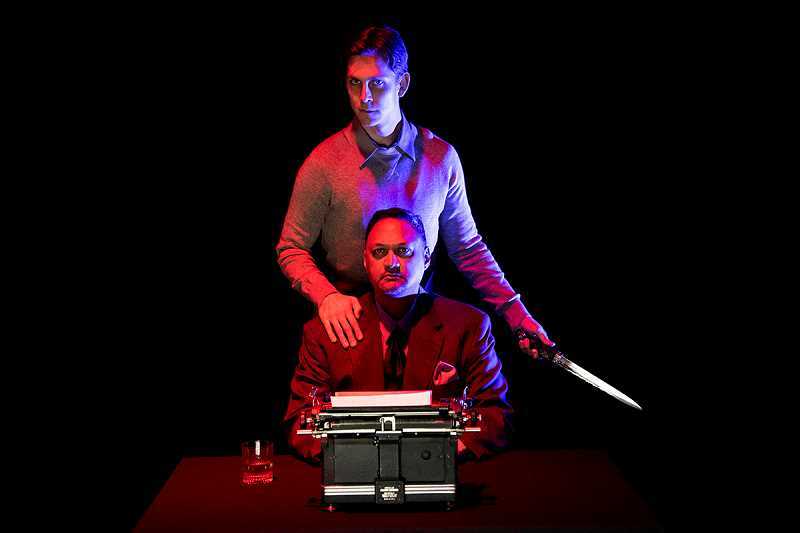 "Deathtrap" explores once-famed playwright Sidney Bruhl's yearning for more success, and is played by Lawrence Siulagi, an associate artist at Bag&Baggage. As Bruhl searches for his next big break, he is found in a power struggle with former student Clifford Anderson, played by resident artist Andrew Beck. While wanting to keep the story a surprise for its audience, Bag&Baggage is up front about one gutwrenching detail: someone will die. And the audience will be right there in the heat of it all, Palmer said. "Expect to be very close to what is happening and feel connected to the action in the theater," Palmer said. The Vault Theater holds about 125 people per performance. With the intimate space, the audience also sees the intricate details in the set, which will intentionally remain the same throughout the entire performance. "The play's characters speak about the perfect recipe for a thriller: one set, five actors, two acts." Palmer said. "That is also what this production is, the very same." The story unravels outside Sidney Bruhl's colonial home in New England, in a barn that he converted into his workshop. The set designers used exposed, interwoven wood, and maintain a simplistic, minimalist look to not to distract to the amounts of weaponry to be hung on the wall. "It is a very beautiful but threatening look to the room," Palmer said. Beck said "Deathtrap" is worth a watch because of how it contributed to its genre. "Why the TV show 'C.S.I' is so prevalent is because of Sherlock Holmes, and that is what Deathtrap has done with modern day thrillers with its twists and turns," Beck said. Palmer said he often compares the story to the Hollywood blockbuster, "Jaws." "'Deathtrap' started that 'oh my God, I didn't see that coming,'" Palmer said. "You know there is a shark (in 'Jaws'), it's on the poster. You know there is a murder in Deathtrap, it's on the poster. What you don't know is who is going to do it. Those explosive moments and twists, that started with 'Deathtrap.'" Marked as the longest running thriller in Broadway history, Palmer said the classic has held up so well over time that it could have been created "two days ago." "The impact of people who are greedy and would do anything for money, that is a very much contemporary theme," he said. "There are a lot of examples today that would do anything to get themselves rich or famous." It also taps into people's dark side that they don't want to see in themselves, Siulagi said. Not only does "Deathtrap" bring horror, but it sports a comedic side to its action and dialogue as well. "The show is very funny with hilarious moments in it, but that doesn't mean its not objectively horrifying," Palmer said. "Anybody who doesn't think comedy and the really frightening doesn't sometimes have humor with it, that is a mistake." Bag&Baggage is bringing its usual flair to the production, developing characters more than what is written, Palmer said. The cast and crew constantly circled back on how to portray "Deathtrap's" characters to fit 2018 rather than the antiquated ideals of the 1970s. One example is Myra Bruhl, the main character's wife, played by Bag & Baggage associate artist Morgan Cox. Palmer said Cox worked alongside him to "take the role apart" and explore how to portray her to a modern-day audience. "This is a radically different interpretation of that female lead in this production," Palmer said. "It is very feminist, very contemporary interpretation of Myra." Myra is described in the script to be a traditional housewife, but that did not sit well with the cast and crew, Palmer said. "We all looked at each other and decided that is not how we wanted to depict the female characters in this play and ultimately came to the agreement that we want to show the female characters as deep, complicated and as interesting as the men," he said. Other actors in "Deathtrap" include Eric St. Cyr as attorney Porter Milgrim and Mandy Khoshnevisan as psychic Helga ten Dorp. The show is hosting a "pay what you will night" on Thursday, Oct. 4, allowing guests to donate whatever they choose. Its official opening night is Friday, Oct. 5, with tickets $35 for adults, and $27 for seniors and students. The show runs through Wednesday, Oct. 31.